Just like the fives of the other suits in the tarot, the Five of Pentacles symbolizes adversity. It shows two individuals walking outside while it is snowing. Not only are they cold, they are also sick, poor, tired, and hungry. It looks as if they are lacking the basic necessities of life. A lot of people can relate to the two individuals in more ways than one. One of the individuals in the card has crutches, while the other figure has a shawl covering her head. She is walking barefoot in the snow. There is a black wall in the background with a stained glass window featuring the five pentacles, suggesting a church of some kind. More often than not, the Five of Pentacles is a bad omen. However, do not fret, as it can change depending on where it is placed in the reading. Whenever the Five of Pentacles shows up in a reading, it suggests a time of hardship and insecurity. The meaning of this card can be deep loneliness, illness, poverty or loss. Your status might take a turn for the worse in the near future. There is a chance that you will lose something significant, whether it is financial wealth or an important item. Deterioration of your health might be already ongoing or be very sudden. There is a chance that you will lose something significant, whether it is financial wealth or an important item. The person with crutches has a lot of symbolism. This person may be feeling cursed - that their bad luck is something that they can t shake off easily. The Five of Pentacles symbolism can also be that of old debts, high credit card balances, or unpaid loans. It is a reminder that you should consider sorting out your finances. Mistakes you have made in the past might also haunt you. 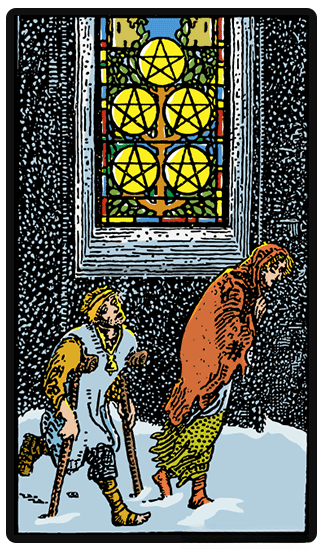 The Five of Pentacles is not a good sign when it comes to questions relating to love. It can be an indicator that the person you love is not feeling the same way. And just like the figures on the card, you might feel like you were left out in the cold. Unlike the upright version, the Five of Pentacles reversal meaning can be a positive one. The snow is now on top, which represents brightness coming into your life. The stained glass now symbolizes a passageway with the Pentacles serving as the light at the end of the tunnel. The reversed Five of Pentacles means change is coming. When drawing this card, it can mean that the worst is now over, but don t expect changes to happen overnight. It will take some time before you can recover, and find strength once again. This means you will be able to regain stability in terms of property, health, relationships, business, or finances. Slow recovery from illness can be indicated by the Five of Pentacles reversed as well. You will be able to find a treatment that can lead to recovery. If you are caring for someone, then it can mean that help will be made available, whether it is financial or practical assistance.